Every year more and more people attend this desert gathering from all over the planet. Why? 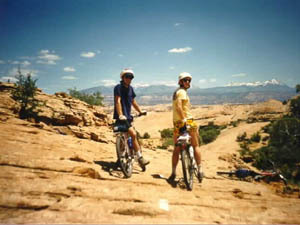 Moab is to mountain biking what Hawaii is to surfing. Dates: May 15-19, 2019 — Our 31st year!. NOTE: This is the one and only regularly scheduled adventure we lead. 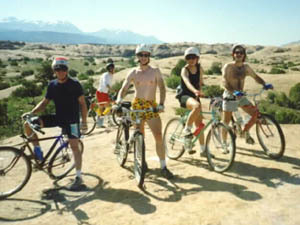 This is the adventure you want to attend to meet out network of desert adventurer and your new friends. This trip is always in May and typically the third weekend. Contact us for details. 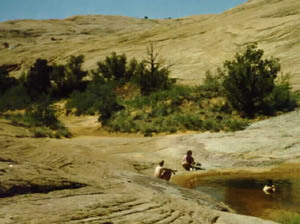 This is our most popular group camping trip.This trip uses and established base camp to explore the famous trails, Slickrock, Poison Spider Mesa, Porcupine Rim and Bartlett Wash to name a few. Ride with the group or explore on you own. 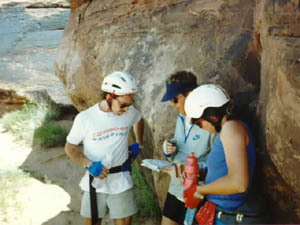 Optional nature hikes, river plunges, fossil expeditions and day trips to Arches National Park are but a few of the activities that round our this great adventure. Food, water, camping and savory food preparation by our desert gourmet chefs is provided. 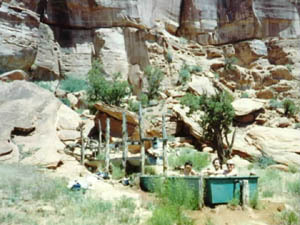 Showers are provided at the camp via solar showers. You provide your own transportation to and from the rides which are accessible with any automobile. Carpooling is encouraged. Many rides start from camp. Music, games and other group activities are available. The adventure is suited for beginning to advanced riders. Hikers, climber, rafters and kayakers are also welcome. It is very important to note that this trip is NOT A GUIDED experience. There are too many people, too many options, and too much territory for the rides to be guided in the official sense. If you are a novice rider we will be able to give you special attention but you will ultimately be responsible for yourself.